Get ready to say goodbye to the incandescent light bulb. If all goes according to plan, the phasing out of Thomas Edison's invention will begin next year and continue through 2014. By that time, light bulb makers hope we'll have adopted LED bulbs as our new favorite light source. That said, manufactures have to overcome a few obstacles before consumers will be ready to make the switch. Some people may wonder why we can't just stick with incandescent bulbs if reinventing the light bulb is such a challenge. It's a matter of efficiency. Less than 10% of the energy running through an incandescent gets converted to light -- the rest is lost as heat. If we switch over to more efficient bulbs, we could save billions of dollars, decrease our thirst for oil, and reduce greenhouse gas emissions. Many wouldn't fit in old fixtures. They produced a flicker laden, dim, gray light. They didn't work with dimmer switches. And, to top it all off, they contain mercury, so you can't throw them away in the trash -- at least not with a clear conscience. The latest generation of CFLs can produce light of the same quality as incandescents, but they haven't solved the other issues. And even if they had fixed everything, I don't think it would have mattered. With the possible exception of people who grew up watching Captain Planet, the public has generally rejected CFLs -- so much so that the Tea Party attempted to have Congress repeal the ban on incandescent bulbs. Thanks to the market failure of CFLs, LEDs will have to be so good that they make consumers already inoculated against new lighting technology forget about their previous disappointments. The engineering problems alone make this a difficult task. White LEDs give off a blue-tinted light, which isn't as pleasant as the warm incandescent light we're used to. And to burn as brightly as standard 60-watt bulbs, LEDs have to remain relatively cool. Philips' (PHG) AMBIENT LED seems to have solved both of these problems. I picked one up recently and installed it in my living room. The thing doesn't look like a light bulb. Instead of the familiar globe shape -- which CFLs mimic to a certain degree -- the LED bulb is a fluted aluminum tube with orange plastic panels at the top. I honestly doubted it would work, but it produces warm light on par with a 60-watt bulb while only drawing 12.5 watts. Here's the catch: The bulbs cost $25. This hefty price tag stands as the biggest obstacle to LED adoption. General Electric (GE) expects the price to drop to $10 in the next three years, but they'll still remain the most expensive option. A four-pack of 60-watt incandescent bulbs costs $1.47, while four CFLs go for $6.47 and a halogen bulb can be had for about $4. Granted, LED bulbs should last significantly longer -- Philips claims mine will last two decades -- and use less power than the competition, but getting consumers to overlook the higher price still poses a challenge. Philips' strategy is to convince consumers to think of light bulbs as durable goods. Its LED bulbs are packed more like gadgets rather than light bulbs. The packaging for the AMBIENT is shaped like a miniature display case. A picture of a pleasantly lit living room and boxes touting the potential energy savings frame the blister-packed bulb. In spite of the challenges, the industry remains optimistic about LEDs. Home Depot (HD) believes the bulbs will account for 25% by 2014. In the meantime, commercial sales have begun to gain traction. 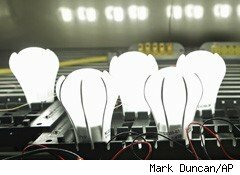 Many companies have begun switching to LEDs after realizing the can reduce energy costs over time. According to The Washington Post, GNC (GNC) installed LED lights in 2,000 stores, while Starbucks (SBUX) put them in 8,000 locations. This could help bring more residential customers on board by allowing them to see the quality of LED light without having to open their wallets. The Motley Fool owns shares of Starbucks. Motley Fool newsletter services have recommended buying shares of The Home Depot and Starbucks. Motley Fool contributor Patrick Martin owns no shares of any of the companies mentioned here. You can follow him on Twitter, where he goes by @TMFpcmart03.